To sum up this book I will say that this is a YA fantasy book and it also has a girl power edge to it. Add in some magic and a mysterious curse and you have one fun tale. I do have to say one thing about this book. I also think it is why some people shy away from YA in general. I admit to becoming frustrated with characters in this book. However, unlike other YA, I did not become frustrated with the main character. She was naive, but that is to be expected. I was frustrated with everyone around her trying to force ignorance upon everyone else. Frustrated with how they refused to listen even when it might contain valuable information or in how they excused what they did and pretended it wasn't a choice (Larkin called many people out on this behavior so she was no shrinking violet). Often this behavior is relegated to the main heroine but not here. She was smart and thoughtful. Larkin also knew she had to live in this world (and in a way another... but I won't explain that one for fear of spoilage) and she knew she would have to make some hard decisions. However, she was not fooled into believing a gilded cage was anything but a cage. For that reason alone I loved this character. By the end of the book I was fully invested but I didn't totally love the romance in this one. I didn't hate it either, but it is the kind that I am certain will grow on me as the books grow. It at times got in the way of her journey, but not so much it bothered me. The reason I think I will become invested in the romance is because her chosen started to grow in ways that seemed uncomfortable for him because he knew he needed to consider more than his own feelings. This is why I know I will eventually enjoy the romance as the relationship continues in the story. My biggest problem came at the end. It ended! It didn't quite feel like a cliffie, but then it wasn't finished at all. I knew that would probably be the case but I still wanted to continue my journey and there was no more journey as yet. I eagerly anticipate the next book in this series. I give this book 4 1/2 stars and if you are looking for a adventurous YA book with a good heroine, try this one. I really enjoyed it and I think you'll find something fun here as well. Bloggy note: Thanks for coming back! I'll have a short post explaining later but thanks for sticking by me! 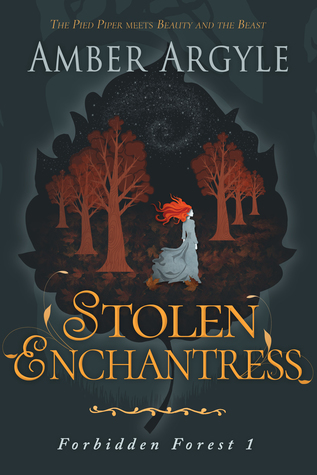 💖 Oh and as of this writing, the book, Stolen Enchantress is on sale for $0.99 at your favorite ebook retailer (Amazon affiliate link: https://amzn.to/2JUhKsX). oh it looks so good there and it's the first time I hear about it! Oh I really enjoyed this one. I have a feeling you'd really like this author Melliane! Glad to see you posting again Melissa! The storyline sounds familiar and I feel your frustration and I assume the townsfolk. Great review Melissa! It was a good frustration as it set the heroine apart. This one was fun! Thanks! oh wow this looks interesting, never heard of it before either o.o does look like it's worth the read - the MC sounds great. Thank you for putting this one on the radar.. is this a series? Thanks for the heads up that this one doesn't get into those annoying YA tropes so much and offers a great adventure and hints of good things to come. I'm curious about the forest's secret and the beast. This is definitely one I need to check out, I'm all for girl power and magic. Wonderful review! Glad this was good. I like good YA fantasies these days. It is frustrating when characters act like that, or don't listen/ act stupid, but other than that this one sounds like a winner. Nice review. I agree, but in this case it wasn't the main character and it did provide a contrast to her character. I'm glad you had the patience for it. I don't know if I could be so generous. :/ Looks like your patience paid off? Oh yes! I hope I was clear, but perhaps not? I really enjoyed it and I do tend to enjoy books that are about more than the romance. The heroine was great! Oh do try her! I think you'll like her writing. Oh oy on the ending just ending. That kills me. Interesting it wasn't the heroine but those around her. I know! LOL I really liked the heroine! This sounds good although I do not read this genre I am always meaning to. Great review and have a great week! I have been enjoying YA fantasy lately! Try it, it isn't so heavy handed as traditional fantasy. Not for me but what a beautiful cover. Sometimes you just have to stick with the series for it to all get fleshed out and have it all make sense. It sounds like the romance will get better. Actually you might like at least some of this one. I think you'd really like how she portrayed the heroine. Still might be a bit too YA for you. This is brand new to me but I am intrigued. I love my YA fantasy with a large dose of girl power! Me too! :D I think you'd like this one. I don't read a lot of YA but I do like some fantasy. This sounds interesting. You might try some of the YA fantasy out there. I've been enjoying it a lot lately. This sounds like it might work for me, I'm one of those that have issues with some YA/NA books :D Thanks!! I don't read this kind of fantasy as a rule, but it does sound good. The monster?in the forest and all that sounds interesting. I am glad the heroine wasn't frustrating as seemingly everyone else. Not sure if I could have kept reading it for that reason, but since you ended up with 4.5 stars it redeemed itself for sure. Glad you enjoyed! I think you'd like how she was portrayed here. The townspeople were upsetting but it really contrasted well with the main character. This sounds kind of interesting. This sounds like it has all the elements that make for a great YA read. I think you might enjoy this one Tracy! LOL! I hope you enjoy it as much as I did! Naivety is so hard to get over, with some of these characters--but other than that, it doesn't sound so bad! It was understandable with her age, but she is smart so it works! I don't think this one is for me! I love the premise, but frustrating characters really turn me off of a book. I know it's to be expected, and you said the main character wasn't as bad, but when *everyone* else seems too ridiculous to deal with--I'm out. I really like the cover! Actually it brings the intelligence out in her character. I like that she was taught not to think for herself but did anyway. Thanks for letting me read it! Yes. I think that is exactly what I felt. :) This one was a fun one. Glad you loved this - I don't read a lot of fantasy but will keep this in mind! Oh I've been having a lot of fun with YA fantasy. You might try those first. sounds like good YA fantasy, that cover is gorgeous. I'm a big fan of YA fantasy and retellings so I'll definitely be checking this out. The heroine sounds smart and resilient! Yeah! Oh yea! check this one out!